A war. A hero. A conflict. A journey. These are the components of any timeless tale, dating as far back as the ancient Greeks. In fact, they are the prototypical “hero’s journey,” as epitomized by the second-oldest known Western text in history, well-known to many high school and college literature students as Homer’s The Odyssey. 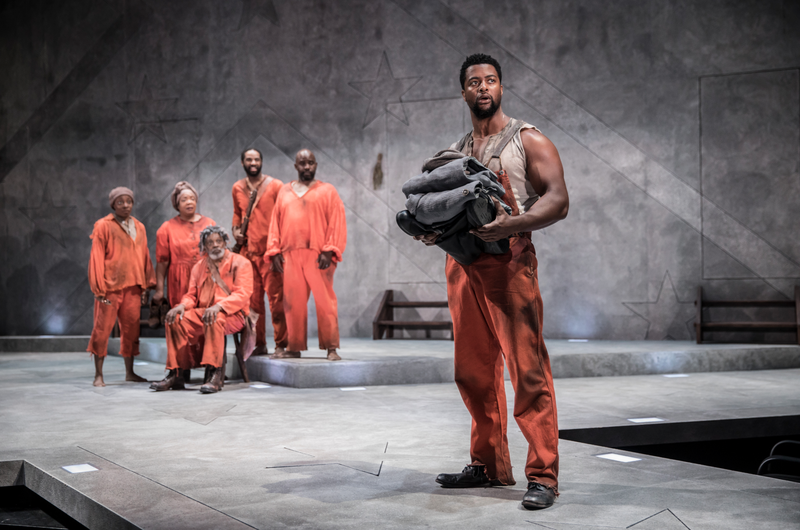 The hero’s journey is also the premise of Pulitzer Prize-winning playwright Suzan-Lori Parks’ in Father Comes Home From the Wars (Parts 1, 2 & 3), which made its Chicago premiere Monday night at the famed Goodman Theatre, directed by Bessie Award-winning director Niegel Smith. [Greek] plays are very sturdy, and also beautiful—like a piece of furniture. And what’s nice about something that resonates is that it carries with it all the concerns and anguishes and hopes and dreams of all people throughout time. Parks’ Hero is a slave on a plantation in West Texas, faced with the ultimate moral dilemma when “asked” by his master to join him as he goes off to fight in the Civil War—as a Confederate. What follows is an odyssey that raises questions about race, responsibility, loyalty, freedom and, most significantly, the “worth” of a man, both figuratively and literally. Originally staged in 2014 at New York City’s Public Theater and starring Sterling K. Brown (of This Is Us fame), Father Comes Home From the Wars at the Goodman features Kamal Angelo Bolden in the role of Hero. Both Bolden’s presence and his portrayal are striking, stirring conflicting emotions in the viewer, who is, by turns, forced to consider the black man as beauty, as brute, as prize and as broken. [W]hen I wrote the first three parts of Father Comes Home From the Wars, they spoke to the way we used to be and the way we are, and that hasn’t changed. I find it interesting that people are so surprised by what’s happening these days. It’s been happening for a long time. Race relations [haven’t] all of a sudden taken a turn. We are consistent in our relations with each other. One of the things I wanted to do for our production here at the Goodman was to actually really use the contemporary symbology that really expressed to our audience that these structures that Hero and the other enslaved folks in the play are part of—and even the master is benefiting from—are ones that we still have today. And so, the use of the Confederate flag as monument is a way of saying, “OK, so here we are in the Civil War. All three relocations of these three parts are in the South. What is the pervasive sentiment there?” And I think that there’s so much to be read and taken from the Confederate battle flag, and so I sat it there. And then, looking at how black folks are still enslaved by systems—that’s how we arrived at prison orange as a unifying color for enslaved people’s garments. ... We see that there are more black folks in the penal system today than there were in enslavement during the Civil War. And so these structures that have oppressed brown-skinned people in America are part of our history and a part of our present. And I’m hoping that these choices help to make the piece resonate, not just as a piece of history but, you know, as a historic legacy that we still live through. The production is powerful and Smith’s direction masterful, deftly guiding the audience through a panoply of emotions while taking us on Hero’s journey in three acts, punctuated by songs composed by Parks and music and sound designer Justin Ellington, and gorgeously sung and played by Chicago-based blues musician Melody Angel. One of the things that I think is so powerful and engrossing about this drama, you know, Susan-Lori is looking at how the character of Hero is actually inside of the mindset [of], you know, the capitalist white supremacist worldview of the South during the Civil War. And that is a worldview that ... hasn’t left us still today in many ways. Father Comes Home From the Wars (Parts 1, 2 & 3) is at the Goodman Theatre in Chicago through June 24.